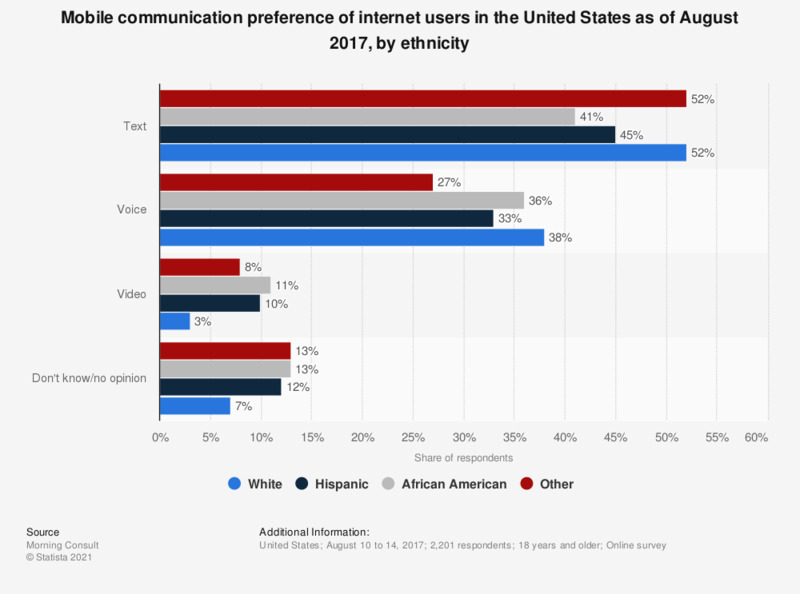 This statistic ranks the most common mobile communication preference of internet users in the United States as of August 2017, sorted by ethnicity. During the survey period, 45 percent of Hispanic respondents stated that they preferred to communicate with others using text. Original question: Do you prefer to communicate with others using text, voice, or video? Everything On "Internet usage of Hispanics in the United States" in One Document: Edited and Divided into Handy Chapters. Including Detailed References. Statistics on "Internet usage of Hispanics in the United States"
How often do you use these ways of staying in touch on your phone? Which communication methods do you use on your phone and how often?